BL and David discuss The National Enquirer Blackmails Jeff Bezos, and his response; the egg that broke Instagram; Spotify’s big move into podcasts; Refrigerdating; inclusive new Emojis; endangered animals singing; Google’s forced opt-in advertising take-over; Twitter’s haters; Echo’s terrible Kindle reading; Delta’s creepy napkins; Rep John Dingell’s hilarious Tweets; Pro Tips for email; podcasts worth a listen … and much, much more! The egg that broke Instagram is now a do-gooder. Can this phenomenon last, or is the egg cooked? …And free podcast publishing platform Anchor. 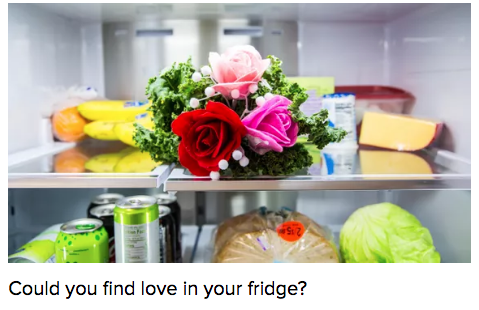 Samsung wants to turn your refrigerator into Tinder. Then you can swipe on refrigerator contents that match yours. 230 new emojis have been approved by the Unicode Consortium for use in 2019. In a powerful World Wildlife Fund animated video, animals sing an emotional rendition of “I Dreamed a Dream” from Les Misérables. There’s also a fascinating video about making the animation. Amazon CEO posts stunning details to Medium of an alleged attempt by AMI, owner of The National Enquirer, to extort and blackmail the owner of the Washington Post. If you don’t opt out, Google told companies and agencies, we’ll take over management of your ad campaigns next week. In violation of its stated policy, Twitter allowed an altered photo comparing women members of Congress who wore white to the State of the Union to the KKK to continue to circulate on its platform. Just enter the name and company and you get the proven or the most likely email configurations for that person. You get 100 free searches a month. A new USA Today Podcast Network show with Tracy Oswald and Andre Archimbaud as co-Producers and co-hosts. Among their guests: Brian Moran, CEO, Small Business Edge; Jess Tyson, Owner, Director of Calm; Peter Shankman, founder of HARO. 163 Marketing Reports from January – David has compiled a ton of stats and reports from the previous month. Rep. John Dingell, the longest serving member of Congress in US history, who became known for his epic and often hilarious Twitter account, died Thursday at the age of 92. He loved taking pot shots at Trump, that were often laugh-out-loud funny. He Tweeted to the end to his more than 250,000 Twitter followers. Safe to say @realDonaldTrump has had the least productive first 100 days in office. Except maybe Harrison, who died of pneumonia on Day 31. Do not assume someone who goes by initials is a man. Use Google to search that person’s name and you will find sites and profiles that person uses that undoubtedly have a photo or a pronoun identifying their gender. This process will take only a few seconds. Go to at least one of the links and see what the person writes about. That way, you (PR people) would know that the person doesn’t cover agency news, for example. While you’re looking, see if you can find the name of their dog or cat, or their favorite activity. Many people list these in their Twitter bios. ONLY after following these steps should you email the person. Bonus Tip: Learn to use BCC in your emails so you don’t show everyone your press list. Doh!